Awarded by the Toloma Lodge 64, Order of the Arrow, Greater Yosemite Council. 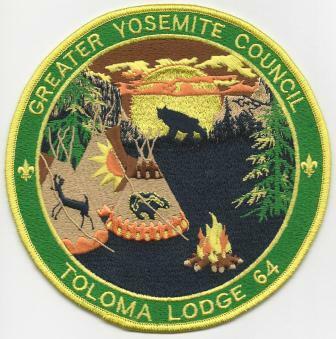 The center patch ($10.00 each) may be purchased by anyone through the Greater Yosemite Council Service Center and has no requirements. Rocker patches that can surround the center patch have requirements and must be purchased by the unit leader after filling out the proper form. There are two types of rockers, camp patches and nights of camping patches. Camp patches are earned by spending the required nights camping at each of the camps owned by the Greater Yosemite Council. These camps are Camp Mensinger (5 nights), Camp McConnell (2 nights) Camp Minkalo (2 nights), and Camp Isom (2 nights). Required nights must be during one visit to the camp. Scouts and Scouters can earn Nights of Camping rockers (25, 50, 75, and 100 nights) by camping that number of nights with the Scout unit. To purchase the rocker patches ($1.00 each) the unit leader must fill out the Nights of Camping Form and mail it to the Greater Yosemite Council Service Center at the address shown on the form.